Lovely 3 bedroom, 3 bathroom villa with private pool, available for self catering. Walking distance from Coral Beach Hotel and beach. Sea views. Sat TV, PlayStation 3/blu-ray DVD player. Maytag fridge freezer with ice and water dispenser (essential in Cyprus). Washing machine and dishwasher. Air-conditioning and central heating. All bedrooms with shutters on windows providing full blackout (good for lie-ins and siestas). Two large fig trees produce numerous figs daily(mainly June-November), you are welcome to as many as you can eat. Walking distance from a good local supermarket and a range of restaurants, yet quiet location. 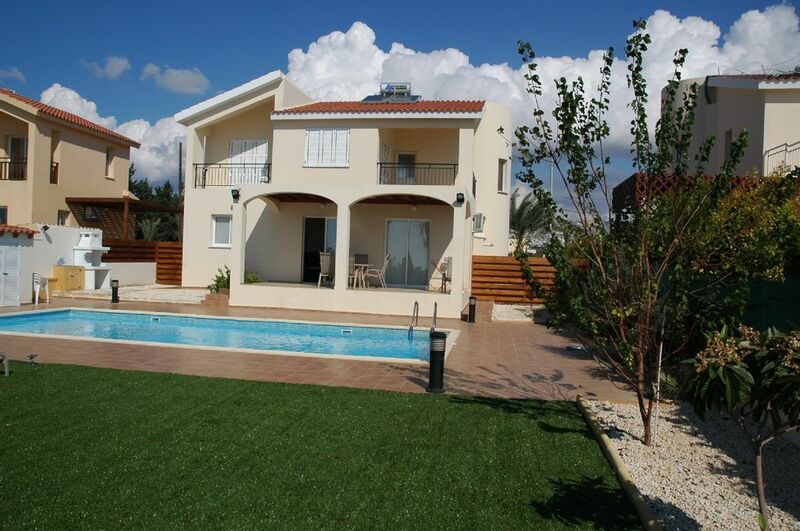 Close to bus stop with regular service to Coral Bay shops and restaurants as well as Paphos town and harbour. Taxi rank in nearby hotel. Coral Bay and Coral Beach Hotel have a range of watersports including, water-ski, jet-ski, paragliding, wind-surfing, banana boat and variations, pedaloes and even scuba diving. The property was expected ,it was in a superb position/area,lovely pool,great size garden,kitchen rather small as was the dining area but as the weather was great we didn't use the dining area. Unfortunately the 1st impressions weren't that good as although the property had obviously been cleaned the decor was grubby in places,inside the kitchen cupboards hadn't been cleaned. Large cobwebs on the stairs and as the property had been cleaned that morning these should have gone. We are used to a cleaner part way through our holidays and I hadn't taken on board that there wasn't one which wasn't a problem but there was no access to fresh linen and no drying area for us to wash our own sheets. On saying all this I would stay there again as positives outweighed the negatives despite the next door neighbour using his hedge cutter at 7am as we are early risers and we found it funny. My wife and I had a lovely holiday in this villa for 10 days with our daughter and my wife's parents. The villa itself is extremely spacious and well appointed, with everything we needed provided. The swimming pool is very large, and the balconies and bedrooms have beautiful views out over the sea. The villa is also in a great location, far enough away from the main Coral Bay strip to be quiet and feel secluded, but close enough to shops, beaches and other services so that you can get everything you need. Nicos was also a brilliant host, responding very quickly to all emails and enquiries before we went, and even offering some very helpful suggestions for local beaches and restaurants. The ones we tried were all lovely, and we're definitely planning a return visit to see the rest. We had a wonderful time staying here. The villa was as described and had everything we needed. The beds were really comfy with good quality bedding. The pool was wonderful and it was great having a deep end and a shallow end which the children could stand up in (often we've stayed in places where the pool has been one depth and too deep for our children to stand up in). The villa is also a very short walk to the beach which was a beautiful sandy beach and very safe for the children. Nicos gave us plenty of information and always replied to emails v quickly. We would love to visit again and had a perfect holiday. Thank you! Perfect for a relaxing family holiday. We stayed over the Easter holidays with our 2 girls aged 6 and 5. The villa is spacious and well equipped. The pool is fantastic - a great size, private and very clean. Although our stay was early in the season the weather was still lovely - just warm enough for swimming and sun bathing but not too oppressive in the middle of the day that we needed a break. It was also great to be able to take the short walk to Corallia beach for the girls to build sandcastles and make friends as soon as their feet hit the sand. I loved swimming here too - really calm and clear water. We enjoyed driving to Paphos in the evening for dinner but equally found the local supermarket in Coral Bay excellent and enjoyed cooking in the villa too.There are also lots of options for day trips and sights to visit too. Everything is well signposted. Overall, it was just what we needed to recharge our batteries and create some great memories. Nicos was very helpful throughout as were his team in Paphos. They delivered a parasol on our first day and lots of helpful advice. Thank you for a wonderful time. Villa Antigone has everything you need for a wonderful holiday. Myself, husband and daughter (aged 6) and my parents stayed for 10 nights in July. The location of the villa was perfect for us – in a quiet and peaceful location but with the beach, buses and taxis less than a 5 min stroll away and only a 10 min stroll to a mini market and selection of bars/restaurants. In addition, you can take the bus (€1.50 per adult) or taxi (€8 for a mini bus) down to Coral Bay ‘Strip’ for many more bars and restaurants – probably walkable, but in the heat or with younger children the bus/taxi option is a better bet. On arrival at the villa for the initial ‘big’ shop, it’s worth getting a taxi to the large supermarket in the main area of Coral Bay (again only €8) for a larger selection of everything. The supermarket will deliver you and your groceries back to the villa free of charge (assume subject to a min value). The bus service is great, regular and reliable. We considered hiring a car, but took the bus instead. A day ticket is only €5 per adult and you can travel all day and get on and off as many times as you like. The villa has great facilities including an American fridge/freezer with ice dispenser and an excellent large swimming pool, in which our daughter spent every waking moment! The area around the pool is spacious too with a selection of fruit trees and pretty decorative bushes – providing plenty of opportunities for lizard hunting – my daughter’s new past-time. There are sea views from the patio and both upstairs bedrooms and balconies. expected – very friendly and reliable. We would not hesitate to return to the villa in the future or in recommending it to our friends and family. This villa has got everything you could possibly need and more. Great location peaceful and private but close to beach, supermarkets, restaurants and bars. The villa is spacious and clean not to mention beautiful, with a big swimming pool that you can actually swim in. There were six of us (two adults and four teens) but there was plenty of space for everyone without feeling crowded, this was very good as the temperature got up to 100F the week we were there. Nicos was very helpful, replying to emails promptly even giving us a list of his favorite bars restaurants and beaches and was particularly helpful with us being able to stay in the villa till late on checkout day. We would not hesitate to go back to this villa and hope to do so in the future. The Villa is a short walk from Coral Beach and Corralia hotels. The nearby beach can be reached without crossing a road. Refundable deposit of 300 euros to cover any potential damages.